"I've been locked up for 264 days." Sold. An opening line like that had captured me completely and I knew right then that I'd love this book. 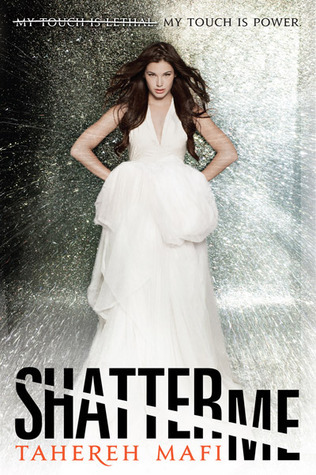 And I was right, I am absolutely adored Shatter Me. I've heard that some people had a problem with Mafi's writing but it was not the case for me. I think it went really well with the way Juliette thinks or processes things. Keep in mind that she was isolated from people for so long and was accusing of being a freak, a monster her whole life even her parents denied her so it's normal that the way her mind works is strange or why she acts a certain way. She is not insane but not in a healthy mind either. Mafi's writing just proved what the Reestablishment/her parents had done to Juliette. Adam, I like him, he has all the qualities of a protagonist. He is a little bit shy but it just shows how cute and adorable he is. Warner, oh my this boy seriously has problems. He is paranoid too much that sometimes I wonder is he really normal or a true psychopath in disguised? The love interest was really good, it made my butterflies into chaos. Adam and Juliette are cute together. It's just so sweet to see how they interact with each other and get embarrassed. Their love is so innocent that I hope nothing bad will happen to them and they would have a happy ending together. I don't know why but I have a feeling that something will go wrong and they will...No I don't want to think about that possibility. Great review! I actually didn't like this book too much because I thought Juliette was a wuss, but I loved the third book because just wow!! Have you read it? Sorry for the late reply. No I've not read it yet since I accidentally read the spoilers on GR =( I'll read it though when I forget all those evil spoilers. Don't know exactly when but hopefully sometimes next year.